The Founders Day Auction sponsored by the Cochranton Area Redevelopment Effort (CARE) will highlight several local artisans. Featured prominently during the auction will be historical drawings by Mark Roche, a 48” round solid oak pedestal table made by Wilfred Douglass, a solid cherry bowl carved by Al Zurney, leather goods by Mark Yoder, a carved wooden sign by Ron Oswald, lap quilts by Dianne Eakin and Tricia Maloney and, of course, this year’s queen size quilt by the Undercover Girls quilt group. Both Paul Rudy and Bob Morrison have helped the group refinish some older pieces of furniture donated by Gary Ross of G&T Clean Out Service. Local businesses have also contributed. Becky’s Bakery will add a plate of homemade baked goods to the auction as well as gift cards from Parkside Restaurant and the Motzing Center. Both local banks, First National and Mercer County State, have contributed as has the local Women’s Club. Members of the local Senior Center will add homemade pies and cookies to the refreshment bar along with Smokey Martin’s pulled pork sandwiches. CARE’s auction committee has been busy gathering up goods for the basket raffle as well. The group would like to thank the countless number of contributors to this special part of the auction. Many local residents has given generously with new or gently used items that will only add to the excitement of the evening. Participants in the library’s Crafters Co-op have donated a basket of their own filled with craft supplies and crafted treasures. Pampas Creek Perennials has gifted the group with a garden basket and snack baskets from both Miller’s Country Store and Windy Knoll have been donated. The Founders Day Auction will be held on Saturday, April 6, at the Cochranton Community Church on RT 285, Cochranton. Doors will open at 5:30 pm. At 6 pm, Jill Tucker, auctioneer, will begin the live auction. Proceeds from the auction will help fund the 2019 projects including French Creek enhancements and events, green space development and historical programs. The group is non-profit and dedicated to enriching the community and surrounding area for both residents and visitors. The event is free and open to the public. The Cochranton Area Redevelopment Effort (CARE) had their annual workshop on Jan. 12 to plan and prioritize projects for 2019. They began by discussing the importance of local culture, the necessity of knowing your community and the value of knowing and helping one another. CARE is committed to those activities that will foster economic growth, remember the area’s history and develop trust and pride within the community and surrounding area. Projects for 2019 dabble in all of that. Ongoing or recurring projects include the Cochranton Founders Day Auction slated for April 6, at the Cochranton Community Church. The auction serves as a fundraiser for the group. This year Cindy Phelps, CARE president, and Melissa Mack Maruska, CARE communications, will co-chair the event. The Undercover Girls, a local quilting group, have already donated their quilt to be raffled the night of the auction and Wyattville Country Gardens have donated an Amish-built lawn swing and frame. The co-chairs have been busy coordinating with community members to help organize the event, soliciting donations and auction items, and start publicity. The French Creek Heritage Event (FCHE) is another ongoing function that CARE will oversee. The 2-day event will feature noted speakers, games, demonstrations, period sutlers selling their wares, battle reenactments and Native American encampments in order to tell the story of the French Creek Valley as it was just prior to the Revolutionary War. This year FCHE is planned for July 14 and 15 at the Cochranton Fairgrounds. As always, it promises to be fun, family-friendly and free. The CARE Golf Outing at Mt. 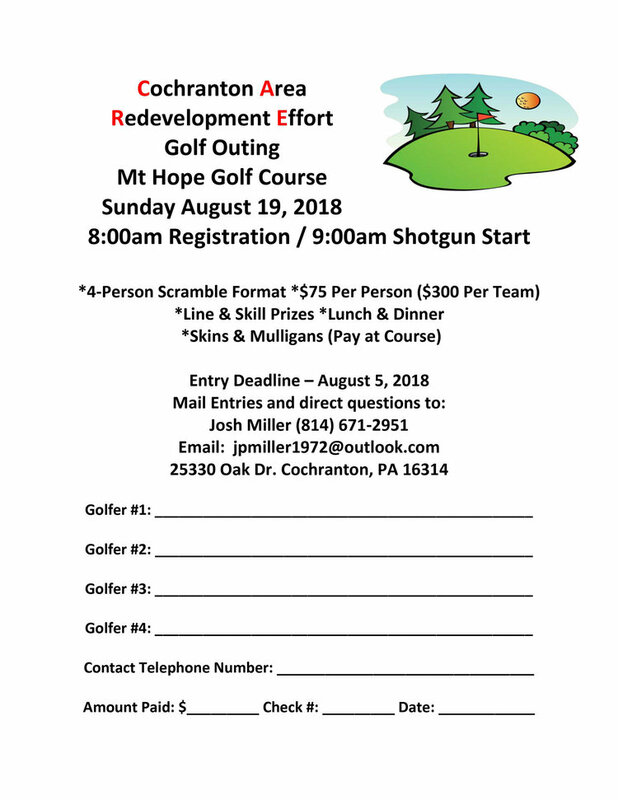 Hope Golf Course in Guys Mills will be August 18 and, of course, the H. L. Moore Christmas Display will light up the town in November. The group is excited that this display will continue to grow and involve more of the town. Projects to be maintained by CARE include the Lions Community Park playground. In order for the playground to remain a viable asset, periodic maintenance will be necessary. Painting, repairing and mulching areas beneath the equipment will need monitoring. The French Creek access areas will also need upkeep. Adding more gravel to the parking area and finishing the tie-ups for kayaks and canoes will also be addressed this coming year. New for 2019 will be the first Poker Float on French Creek. 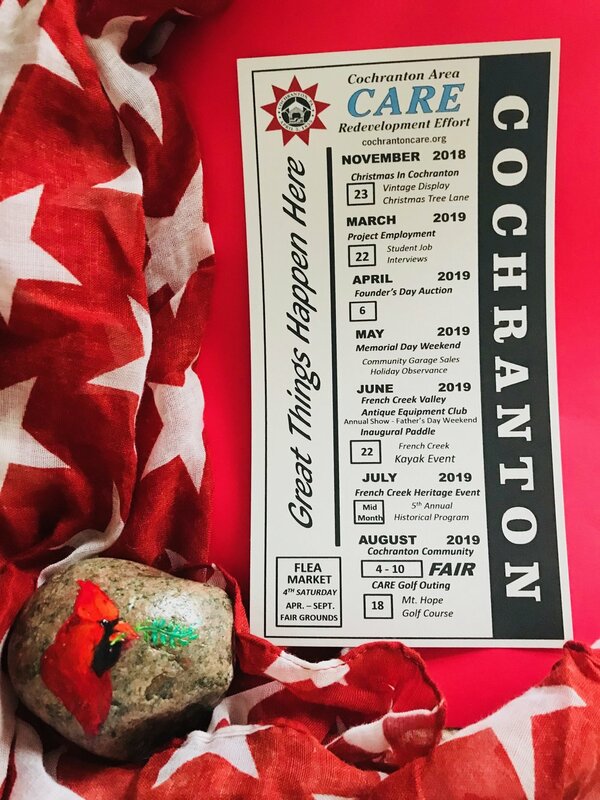 Although still in the planning stages, the float is on the calendar for Saturday, June 22, and will run the 7 miles between Cochranton and Utica. The group welcomed Katie Wellmon, our local branch manager of One Federal Credit Union and CARE board member, as organizer for the event. CARE is proud to recognize French Creek as an asset and plans to make use of it to develop community awareness. CARE is also working on a community welcome package for new residents and visitors. Working with local businesses and real estate agents in the area, the group hopes to reach out and involve more of the community in their projects. Wrapping up the workshop was discussion on new and upcoming projects that are in the works but not ready for launch. Two thousand nineteen promises to be a very productive year for CARE. Stay tuned. Candlelight church services, luminaries along sidewalks, model train displays, choirs, carolers and more recently, Christmas Tree Lane at the firehall all have a place in celebrating the holiday in and about the community. Sadly, however, the most memorable Cochranton tradition, the H. L. Moore Co. Christmas display, has been missing since the early 1960s. That is about to change on November 16. According to an article written in the Heritage Times (Vol. 4, No. 4, 1993), outside Christmas lights at the H. L. Moore Co. were being noticed as far back as 1949. Figures of Santa and his reindeer were flying across the company roof, red bells hung over the door, trees were lit with red, white and blue lights, painted candles and lighted figures crowded the company’s front lawn. The company art department spent copious hours designing and painting the display. Early on, Elmer Barnes, art director, worked on display plans, Chuck Strayer supervised the installation of lights and figures while Ed Hovis helped on the grounds with the layout for several days prior to the holidays. As word spread, the exhibit drew spectators from miles around often slowing traffic to a crawl along S. Franklin St. Nothing said Christmas in Cochranton like H. L. Moore’s incredible display. Gayle Hillkirk, a former plant manager for the company, remembers the work it took to create the display. He fondly remembers how Moore loved his hometown and how proud he was of his art department and their gift to the community. He also remembered when Moore said they would no longer be displayed. Some vandalism had occurred — lights were stolen and figures damaged and that was the end. At Moore’s directive, the display was packed away and stored at the plant for 20 some years. Then, early in the 1980s, the decorations were given away during some spring cleaning of the premises. Squirreled away in the garage of a local resident, the decorations were largely forgotten. When the family of Gene Peterson discovered the decorations, they contacted Mark Roche, an artist and prominent member of the Cochranton Area Redevelopment Effort (CARE), about resurrecting the display. Roche then reached out to Hillkirk who, in turn, contacted numerous individuals to help with the idea. Roche has refurbished the painted figures, CARE has agreed to purchase the needed lights and electrical set-up, the Cochranton Presbyterian Church has graciously offered their grassy lot next to the public library on the corner of Smith and Pine for the display and several people have volunteered to help with the set-up. The Cochranton Borough Office plans to initiate a community-wide decorating contest and the Friends of the Library will decorate the library in time for the light-up ceremony. The discovery of the H. L. Moore Co. decorations has made Christmas in Cochranton a testimony to good old fashion hometown pride and community spirit. Please join us for the official lighting ceremony to take place on site, Friday, November 16, at 6:30. Hillkirk, 95, will be “throwing the switch” to welcome the decorations home. The display is expected to be lit every evening from 6-9 throughout December. The late H. L. Moore would be so honored. C.A.R.E. already has several events in the works beginning with a vintage Christmas display in town using the old Morco lawn decorations. Moving into 2019 several dates have been confirmed and many more are on the way. Stay tuned. CARE will be hosting the Crawford Co. Convention & Visitors Bureau booth at the Crawford Co. Fair on Friday, Aug. 24, from 11-2 in Home Show Bldg #1. Visit us and see what CARE has in store for 2019! The Cochranton Ministerial named C•A•R•E 'Organization of the Year', Sunday, Aug. 5, at the Fair's Vesper Service. We are truly honored. Thank you! Two years ago, the Cochranton Area Redevelopment Effort (CARE) along with the Cochranton Lions Club who own and maintain the community park launched a fundraising effort for the replacement and refurbishing of the playground equipment. It would require $50,000 to update the park. Funds were raised from community members and organizations along with grant monies from the Crawford Heritage Community Foundation. Much of the expense for labor and construction was donated by local businesses and individuals and through their efforts, four new pieces of equipment were installed: the Lunar Net climbing structure, the Double Viper slide for older kids, two Freedom swings and the Voltage Play Structure for 2 to 12 year olds. All play areas have been mulched to cushion the drop zone. Today children of all ages can be seen enjoying the new equipment. Cochranton Area Redevelopment Effort (CARE) along with the Cochranton Lions Club wish to thank everyone who donated their resources, time and monies to this project. Please join us at Cochranton Lions Community Park on Sunday, August 5, at 2 PM for a dedication and celebration of the “new” playground. You are invited! CARE will dedicate the "new" playground on Sunday, August 5 at 2. Join us in the celebration!